There’s a major problem with TRIM today. The only Windows storage drivers to support it are written by Microsoft. 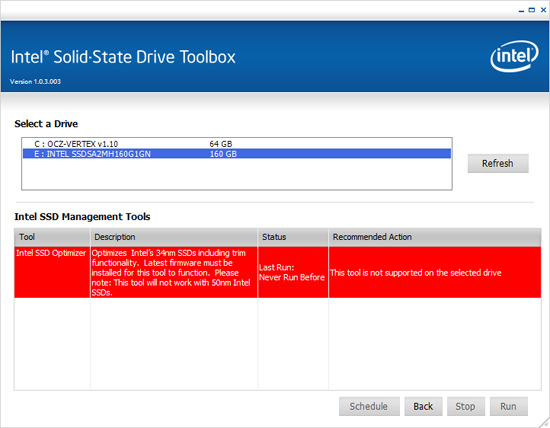 The Intel Matrix Storage Manager (IMSM) driver will not pass the TRIM instruction to your SSD. This means you can't use anything but the drivers that ship with Windows 7. To make matters worse, if you enable non-member RAID on an Intel motherboard the default Windows 7 driver is an older version of IMSM so TRIM won't work there either - even if you don't have a RAID array created. Your best bet is to install Windows 7 with your I/O controller in AHCI mode (for Intel chipsets) and don't install any storage drivers. Intel is working on an updated IMSM that will pass the TRIM instruction to SSDs but it won't be ready for at least a couple of months. TRIM won't work on a RAID array. If you want to use IMSM or if you're using Windows XP or Vista, both of which do not support TRIM, there's another option. Earlier this year Indilinx released its Wiper Tool that performs a manual TRIM on their SSDs. It works by asking the OS for a list of the free space addresses on the partition and then sending the list with instructions to TRIM down to the SSD. On any Windows OS (XP, Vista or 7) regardless of what driver you have installed, Intel's SSD Toolbox will allow you to manually TRIM your drive. Intel calls it the SSD Optimizer, which of course only works on 34nm Intel SSDs (X25-M G1 owners are out of luck unfortunately). Intel's SSD Optimizer should be able to restore performance to about 95%+ of new, in this case it manages 94.7% - close enough. The existence of TRIM changes the way we test, something I alluded to in the SSD Relapse. Thankfully, we come prepared. In previous articles we had to test SSDs in two conditions: new and used. The new state is just after a secure erase, the used state required us to write data to every user accessible portion of the drive first before benchmarking. The former resulted in great performance, the latter meant the SSD had to do a lot of juggling of existing data whenever it went to write. The second scenario no longer exists with TRIM. The act of formatting your drive or deleting files (and emptying the recycle bin) will TRIM invalid data. Performance in a TRIM enabled system is now determined not by the number of invalid blocks on your SSD, but rather the amount of free space you have. I went into a deep explanation of the relationship between free space and the performance of some SSDs here. TRIM will make sure that you don’t have to worry about your drive filling up with invalid data, but it doesn’t skirt the bigger issue: dynamic controllers see their performance improve with more free space. My rule of thumb is to keep at least 20% free space on your drive, you can get by with less but performance tends to suffer. It doesn’t degrade by the same amount for all drives either. Some controllers are more opportunistic with free space (e.g. Intel), while others don’t seem to rely as much on free space for improved performance. Addressing performance degradation as drives fill up (with valid data) will be one of the next major advancements in SSD technology. I've read about some Macbook hacks for the SSD user, but still wonder how I should make my SSD's "new" state last longer. I do still wonder if I should use the "Secure Empty Trash" in Snow Leopard? At first, I've partitioned my drive for all available space, but then reduced the HFS partition to 68 Gb or so - will this prolong my drive's "new" state because of Intel's algorithms? Should I use "Erase Free Space" in Disk Utility? I wonder how many, if any, were sold at $85 (or even $115). I also wonder how this article is repeatedly bumped for minor (and predictable) updates while the incorrect pricing predictions are never acknowledged. The Intel MLC SSDs continue to list for much higher than the given "expected" launch price . . .
. . . yet that article was never bumped to the top. Even the G1s were priced higher! Props to Anand for keeping the SSD companies honest on performance, but why can't the same be done for pricing? lol the promised to deliver it by the end of Novmber, they didn't but they changed the date of release :P i've been checking every day.. The Firmware Update tool 1.5 is now available, posted (according to intel in 30/11) the SSD toolbox still unavailable..
did any one try it ?! It finally came ! The End of November, The 1st of December.. The new Firmware is out and works properly. To test SSD this is a good program, I think. Another great article, thank you for all the hard work and insightful analysis. Articles like yours help keep the industry honest and responsive.